Keep them to marinate for an hour. In the meanwhile, fry the sliced onions in a heated pan on low flame till light brown. Let the onions cool down and crush them. Now add crushed fried onion (only three-fourth), curd, red chilli powder, cinnamon, green chilli paste, cardamom, shahi zeera, coriander leaves, clove, saffron water, mint leaves and salt to the marinated meat. Leave the meat as it is for 1 hour. Now spread a layer of semi-cooked rice in a heavy bottomed vessel. Add saffron color, limejuice, ghee and the remaining crushed onions over the layer of rice. Spread a layer of marinated meat over this, and again spread the remaining semi-cooked rice. Now add the aromatic water in a circular motion over the rice layer. Now tightly cover the vessel with a lid. Keep it on a low flame. Remove the vessel from the flame exactly after 15 minutes. 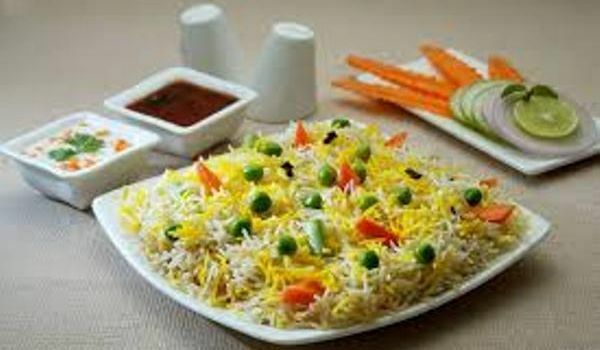 Hyderabadi Biryani is ready to eat. Serve hot. I think the meat should be half cooked separately before adding to rice.